You'll find a lot of advice online saying that everyone should have more than a traditional resume. Video resumes, infographic resumes, career-focused websites, and online portfolios can all supplement your resume and help boost your employment prospects. Making a non-traditional resume can be a lot of work, so how do you get the most out of yours? Read on to learn more about using non-traditional resumes. Before you spend a lot of time working on a non-traditional resume, consider the pros and cons and whether you really need one. Taking the time to investigate what is involved is especially important if you are technological challenged and it's going to take you considerable time, energy, and effort to get up to speed with the tools you need to create an online resume, portfolio, or website. Here are tips and advice for using a non-traditional resume, including deciding on whether it will help you or whether it won't make a difference in the outcome of your job search. Consider Your Industry. Before creating a non-traditional resume, really think about whether or not the resume will benefit you in the job market. Are there skills you have that only a nontraditional resume will emphasize? Do you want to show recruiters your creativity and innovation? If so, a non-traditional resume may be right for you. However, if you’re in a more conservative or traditional industry that does not require much skill in visual arts, you may be best sticking with the traditional resume. The type of resume you have should fit the vibe of your industry or field. Follow the Job Application Guidelines. Follow the guidelines on the job application and be sure to comply with the company's application directions. If they ask for a traditional resume, give them one. If they ask for a resume in a particular format (a Word document or a PDF, for example), make sure your resume complies with that format. Job seekers who don’t follow directions may be weeded out of the applicant pool. Always Have a Traditional Resume Ready. Even if you have a video resume or a social resume online, always give an employer a traditional resume as well. This way, if they don’t care to look at your non-traditional resume, they’ll look at your traditional resume instead of simply throwing out your application. 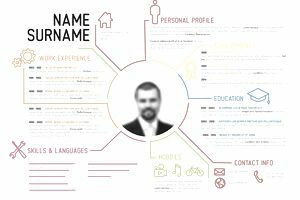 Even companies who like non-traditional resumes will often ask for a traditional resume to accompany your video or online profile. Share Your Resume With Your Contacts. Use your non-traditional resume when you have a personal contact. If you have a personal connection with the recruiter or hiring manager at a company, you can feel more confident providing a non-traditional resume. Because you know that your contact will look at your resume, you don't have to worry about the resume being rejected because of the format (however, if your contact specifically asks for a traditional resume, give her a traditional resume!). Promote Your Non-Traditional Resume on Social Networks. Post a link to your non-traditional resume on your Facebook, Google+, Twitter, or LinkedIn account, or any other social or professional networking sites you belong to. They’re a great way to grab someone's attention. Who knows - someone may check out your resume website or watch your video and reach out to you as a networking contact. Do it Well or Not at All. When a non-traditional resume is done well, the applicant comes across as creative and innovative. When a non-traditional resume is done poorly, the applicant comes across as unprofessional and sloppy. Therefore, only create a non-traditional resume if you have the skills to make a polished professional-looking final product. For example, if you aren't comfortable with a camera, don't do a video resume. Or don’t try to make your own online portfolio if you lack the essential web design skills. If you’re really set on creating a non-traditional resume but lack the necessary film, web, or design skills, there are a number of companies you can hire to help you create your dream resume. However, many of these companies demand high fees, so do your research before hiring a company. If cost is a concern, you may be able to find a recent design graduate who’s willing to create your non-traditional resume for a reduced fee in order to fill out his or her own portfolio. Will a Creative Resume Help You Get Hired?